Stockies Scribbles is back reporting from the Capital of Australia following the Victorian National Training Centre (NTC) Girls Team as they challenge the very best female youth that Australia has to offer. The Victorian NTC girls are competing at the National Institute Challenge in Canberra this week. The Tournament kicked-off on Tuesday August 21 and finishes on Saturday, August 25 to showcase the very best female football players and to select the Australian National Team. 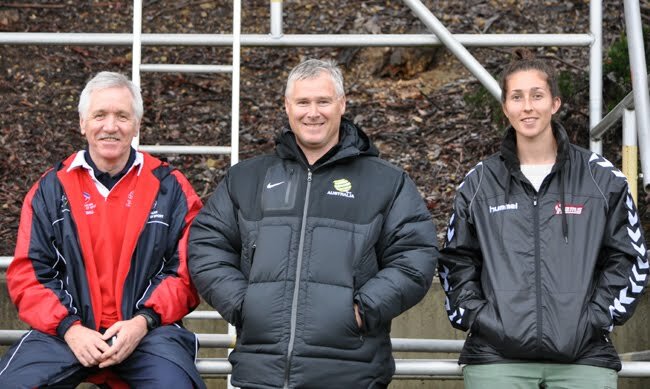 FFA Coaches and scouts are diligently looking over the talent on display as Australia looks to further bolster its depth. Who said Melbourne weather was unfavourable. After two glorious days of sunshine here in Canberra, the heavens opened up and it rained for the majority of the day with temperatures again in single figures. So much rain fell, that both Pitch One and Two at the AIS were unplayable so the Victorian girls were restricted to a spare ground nestled in the very back of the football arena; obviously with the best drainage. Needless to say, the surface was slippery, heavy and the girls needed to be sharp with their passes to circumvent the excess water and slowness of the pitch. The Victorians started with Cassandra Dimovski between the posts supported by Stephanie Catley, Maddie Stockdale, Jacqui Vogt and Alex Cheal; all posing as the “Great Wall of China”. Steph Magro, Cindy Lay and Tiff Eliadis made up the ‘magical midfield’ and up front coach Darren Tan went with Pheobe Parker, Tayla Mure and Dani Gudelj as the ‘terrific trio’. The pace was frenetic from both teams as each tried to assert the early ascendancy and be the first to register a major in the game to gain the psychological advantage. It was excitement plus at the AIS. In the first 10 minutes of play NTC Combined had a free kick with no result, the Victorians then had a creative scissor kick attempt by Dani Gudelj at the six minute mark to thread one over the keepers head before Cindy Lay had a very solid shot on the goal only to see it sail over the cross bar. Shortly after, Pheobe Parker sent a blistering pass to the feet of Tiff Elianis who turned and nailed a right foot missile that was just off target. The Victorian defensive line was strong and with the dropping off of the opposition forwards, many of the offensive plays were coming from the boot of Maddie Stockdale and Steph Catley who were performing a training drill up the left wing and creating many opportunities for the midfield and forwards to seize upon. On the counter, the NTC Combined girls pushed forward down the right wing and drew a soft foul that was awarded a penalty at the 22 minute mark after what seemed a good tackle from the nuggetty defence of Victoria’s Alex Cheal. Enter Cassandra Dimovski, one who loves a challenge and thrives on the ability to psyche the opponent out of the contest. Cassie was ready for the penalty and skilfully flew the right way across the white line to safely deny the Combined effort any score. Football is a fickle game and within four minutes the Victorians blazed up the left wing where Steph Cately received a left foot dart from Maddie Stockdale, side-stepped the opposition and drilled a military pass to Tiff Eliadis who capitalised with a strong right foot ‘crack’ past the keeper and into the net. 1-0 to the Victorians and Tom Sermanni was on hand to watch with his contingent. Thanks for coming Tom. All in all, the first half was a solid performance by all of the Victorian girls from front to back. The second half saw Matilda Steph Catley put her feet up having run about 20 kilometres and she was replaced by Kate Leder at the half time break. Once again, Tiff Elianis was elusive in midfield and was working hard using her body to shield the ball and within the opening two minutes had another exciting attempt on goal but to no avail. Ten minutes in, the NTC Combined team came forward applying pressure to the Victorian midfield and ended up with a two on one against Cassie Dimovski. What looked like a certain goal to the NTC Combined outfit was cleverly thwarted by the young Melbourne Victory keeper and deflected safely across the base line for a corner. The NTC Combined outfit were pushing hard now as time was running out and they had several corner opportunities but the Victorian defence remained calm with Jacqui Vogt and Kate Leder ensuring each forward thrust was repelled. Victoria were awarded a number of free kicks late in the game but none were converted. At the 61st minute mark, Jess Au substituted Cindy Lay who had worked tirelessly in the midfield to add some fresh legs and bring home the final ten minutes of play. With seconds to go, NTC Combined secured a corner and you could hear a pin drop from the Victorian supporter base. Sure enough, the defence again stood tall and the game ended in with a 1-0 win for the Victorian Girls. For all the updates on The Football Sack’s own version of the Mighty Ducks, check out the range of Craig Stockdale’s articles right here.